Since 2007 we have specialised in the adaptation of properties to enable the disabled and elderly to live more comfortably in their own homes. This may be a simple install such as grab rails to aid mobility, or a full bathroom adaptation to provide level access showering facilities. 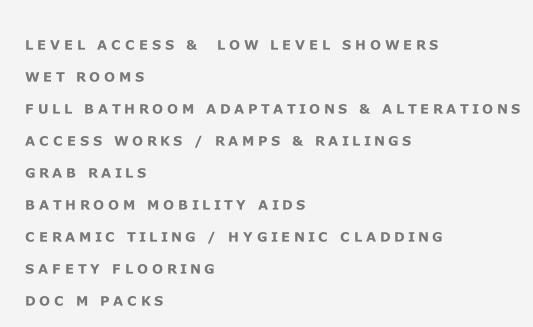 Please take a look at our walk in showers page for options on wet rooms and level access showers.. This service is also provided for the healthcare environment, in nursing and care homes where we understand the needs of the client and ensure considerate, clean and safe working practices. Works are fully project managed, with a single point of contact and tradesmen who are knowledgeable, experienced and sensitive to the needs of the client. Being TrustMark accredited we have been approved for our trading practices, customer service and technical competence, all for your added assurance. Some examples of how we may be of assistance are detailed below, or please take a look through our gallery. Should you require any advice, please contact us, and we will be happy to assist.